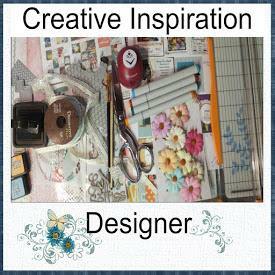 I have completed two more challenges from Creative Inspiration . One was to create your own background. Now I have to admit that this one did not turn out as I had imagined it. Yes, I did do it exactly the way I planned but some how I thought it would be prettier than it is. I thought the colour would "pop" more. 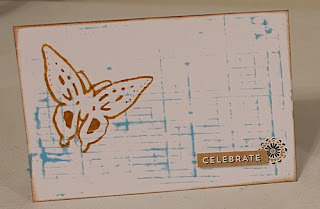 I used Golden's soft gel with Daler-Rowney's blue paint on a TCW stencil. The Butterfly is an unknown stencil. 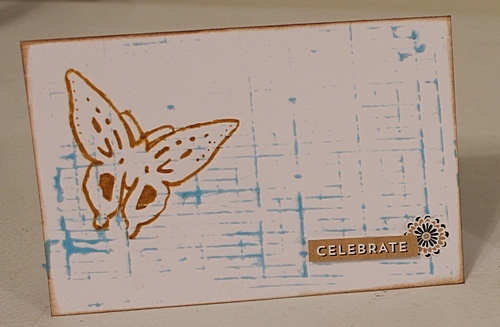 The Celebrate and flower sticker are both from Studio 112. This challenge required the use of a die cut. The frame is my die cut. 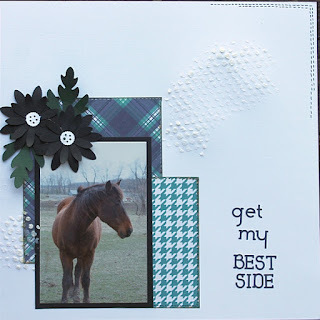 On this card I used papers from Photo Play. I just can't get enough of these papers. They are most definitely the best papers I have used. Their quality is remarkable and they are so versatile. As a matter of fact, I have asked my LSS to order in 4 different packages of them for me because right now all I have are two packages of the Plaid4Fun. The frame was cut using a cut file from the Silouette store and cut with my Cameo from plain white cardstock. The lace is Floral Garden. The flower is cut from a cut file from the Silouette store and cut from Bazzil cardstock using my Cameo. The I love you is from the Plaid4Fun package. Once again I have used PhotoPlay papers, Plaid4Fun, Bazzil Cardstock, I used my Cameo to cut the flowers. 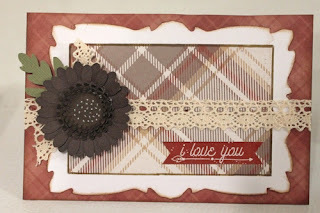 I used Liquitex Blended fiber's with a Tim Holtz stencil for texture and I used Faber-Castell Pitt Artist pen for the "Faux" stitching. Okay, that's it for now I am off to see what other challenges I can dig my teeth into. Please leave a comment so I know you have been here and so I can return the visit. I love this page and love your title. Thanks for playing along with us at Stick it Down. Thanks for playing with SID! Great take on our challenge. ❤️Thanks for playing along with us at Stick it down.